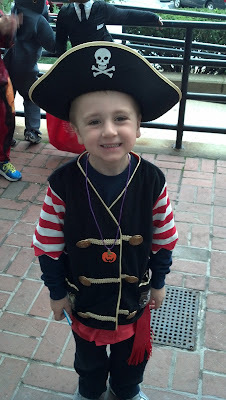 Halloween started again this year with a school trip to the Coast Guard to trick or treat. It is so amazing to get to tour the facility never mind the great decorations and candy they give the kids. They really go all out to show the kids a wonderful time. This year St. John's went as well and we bumped into our best St. John's buddy Caitlin! For this party you are supposed to dress as your favorite book character so Richie picked a pirate. After school the kids dressed in their "real" costumes and we hit the neighborhood. Can you imagine how much candy a kid can get in a short amount of time when the stores are just steps apart?!?! The kids had a blast running around with their friends. And a pizza party to round out the night with all of the kids north end friends. This kind of day makes me think I could start liking Halloween. And did you notice Angela was a monkey again? Yep, she wanted to do the same thing as last year. She IS my daughter! Look who learned how to pump on the swings all by herself!! Yeah for me that I don't have to push anymore! Sorry the video is sideways. You would think I would have learned how to use my camera phone by now! 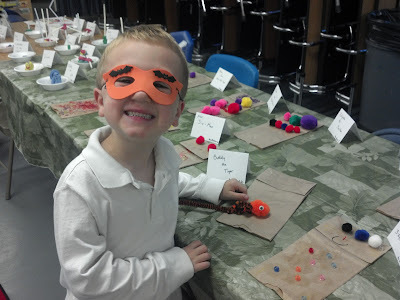 Richie's after school program (Champions) held an art show for the families. You can see all of the beautiful art work and crafts they did. Here is Amelia who is in Richie's class. 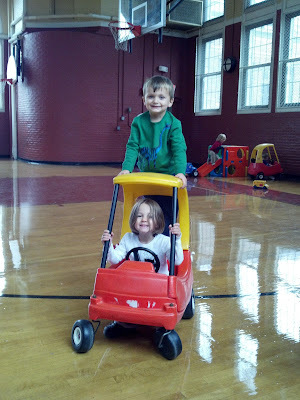 Also, her little brother Coleman who happens to go to Angela's day care as well. Always good to have snacks so the little ones are entertained too! 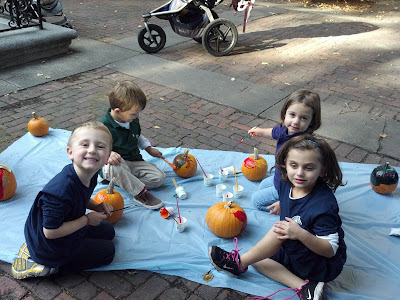 Painting pumpkins on the Prado.....say that 3 times fast! An annual tradition and always a fun time making our masterpieces to sit by the fireplace until Halloween. Since I have never been very good about holiday decorations (except Christmas) we now rely on homemade decorations for this house! Angela with her buddies at Friday playgroup. 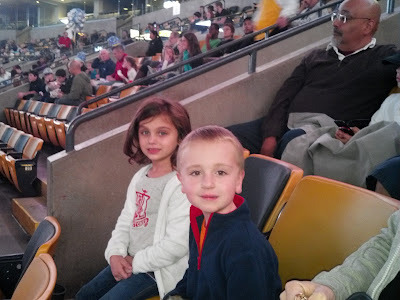 Twice a year we hit the Circus when it is in town and this year was no different. AND this year we went with a whole bunch of school friends. Much more fun when you don't just go with Mom! As I have said every year, having a huge gorgeous Christopher Columbus Park on Columbus Day means lots of partying! I have always loved this holiday because I have off of work and it is usually nice enough to spend the whole day at the park. 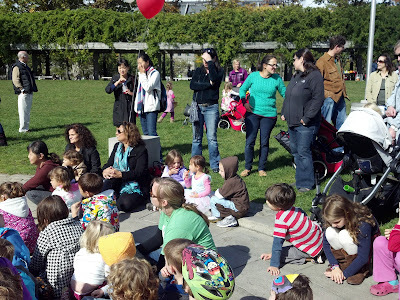 Magic shows, marionette shows, instrument petting zoo, aquarium touch tanks...and all of this with our neighborhood friends at a beautiful park on the harbor! 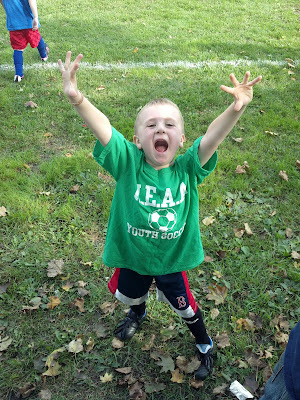 Look who scored his first goal in soccer! Last year he ran away from the ball, this year he scores in most of his games. Needless to say....he LOVES soccer!